Receiving a diagnosis of a chronic disease can be a scary and confusing time; and the impact on family members and children is often overlooked. While the prevalence of COPD is seen in an older generation, educating of loved ones is key factor to promote understanding and support. 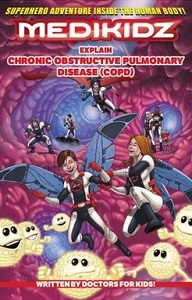 This is why the COPD Foundation is proud to have partnered with Novartis and Medikidz to develop a comic book that provides a creative and innovative way to help those with COPD explain their condition to friends and family, specifically children and adolescents. Medikidz is a children’s medical education organization that works closely with healthcare professionals, families, children, and patients to produce unique learning materials in an interactive, powerfully-visual comic book format, thereby helping to educate children about their health as well as the health of those around them. The comic follows the story of Andrew and Hannah, who are guided by the Medikidz ‘superhero’ team to help them understand COPD and ways in which they can help their Grandma. “When organizations educate the public about COPD, oftentimes we overlook the impact the disease has on entire families and communities. COPD not only affects those who are diagnosed, but their family members and loves ones as well, including children,” explains Fabiana Talbot, director of communications at the COPD Foundation. You can find the MediKidz comic online, here.